Jesus-Islam » Jesus Christ » Why do Christians call Jesus the Son of God? 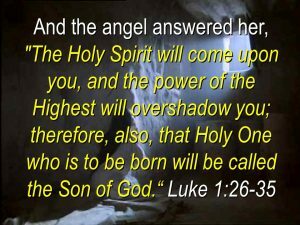 God does not beget children and is not begotten, so how can Jesus be his son? Let us think for a moment of the use we make of the word “son” (ابن). One day I asked a friend his country of origin. He replied: “I am a son of Morocco.” Did he want to tell me that Morocco married a woman to give birth? Absolutely not ! He simply wanted to let me know that he was a Moroccan from head to toe and that he bore all the characteristics of a true Moroccan. Similarly, when the Bible says that Jesus is the Son of God, it means that he possesses all the characteristics of God. Yet, the meaning is much deeper. Those who read and speak Arabic can easily understand this notion. For instance, this phrase in Arabic: فلان عربي ابن عرب, means: this man is an Arab-born Arab. It is used to emphasize the genuine Arabic origin of that person, and to emphasize the fact that he is an Arab with no mix of any other race. So when the Bible says that Jesus is the Son of God, it simply says that he is truly God. We also saying Arabic: فلان ابن عشر سنوات which translates literally as: this child is the son of 10 years. It tells us that he is 10 years old, that is, he is equal to 10 years. In the same way, the expression Son of God, applied to Jesus, means that he is equal to God in nature and in essence. Therefore, when it is said that Jesus is the Son of God, it must not be understood in any way that means God somehow caused a woman to conceive and give birth in any physical sense. It certainly does not mean that God married Mary to give birth to Jesus. Such an idea is blasphemy. God is a spirit, not flesh and blood, and therefore the Son of God, before He came into world did not exist as a physical person, but as God is..
Jesus was conceived by virtue of the miraculous power of God himself, not by any human or physical involvement, and particularly not by any sexual act. Thirty years later, during his earthly ministry, Jesus said to a man, “Do you believe in the Son of God? The man answered, “Who is he that I may believe in him? And Jesus said to him, “You have seen him, and he is speaking to you.” (Injil, John 9: 35-37). Leave a comment: your privacy is safeguarded.